Thai Prime Minister Thaksin Shinawatra says his party won more than 50% of the vote in a snap election he hoped would end a crisis over corruption claims. But he acknowledged support for his Thai Rak Thai party had dropped, and pledged to set up a committee to try to resolve the political crisis. He said on live television he would resign if the committee asked him to. Official results from Sunday's vote are not yet published, but Mr Thaksin said his party had won 57% of the vote. The prime minister told a political talk show that 16 million people had voted for his party, down from 19 million in last year's election. He said Thai Rak Thai had won 349 seats, down from 377 a year ago. "Last year we got Grade A, now it's Grade B," he said. "There's no difference, we've still passed the examination." Mr Thaksin had called Sunday's snap election in an attempt to end weeks of instability over claims by the opposition that he was corrupt and had abused power. But the main opposition parties refused to put up candidates, and in 278 out of 400 constituencies Mr Thaksin's Thai Rak Thai party ran unopposed. The election commission said earlier on Monday that enough votes had been counted to declare Thai Rak Thai the winners. But there were also indications of a big protest vote, particularly in Bangkok and in many parts of the far south. Candidates in 38 constituencies - all in opposition strongholds in the south - failed to win the 20% of votes needed to become MPs, and by-elections now need to be held. All 500 seats in parliament must be filled for it to convene legally, which, under the constitution, must happen within 30 days of the poll. Election Commission secretary-general Ekachai Warunprapha said they planned to run two rounds of by-elections within that period. 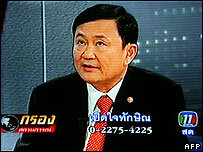 Before the vote, Mr Thaksin said he would step down if he failed to win 50% of the vote. He told the TV programme he was "not shocked" by the result. "I always knew I would lose popularity in Bangkok. But people in the countryside still voted for Thai Rak Thai," he said. But he went on to outline plans for an independent committee of eminent people - which would include three former prime ministers - to consider a way out of the country's political crisis. "If the committee asks that I resign, then I will, if that will solve the problem," he said. Mr Thaksin has been under increasing pressure following his family's decision in January to sell its shares in one of Thailand's biggest telecom groups, Shin Corp, which netted them and others $1.9bn. The move angered many urban Thais who took to the streets in protest, complaining that the prime minister's family had avoided paying tax and passed control of an important national asset to Singaporean investors.